MalwareBuster – Clean and protect your computer from malware threats. MALWARE JUST MET ITS MATCH. Every day, malware and viruses target your PC and threaten your online security. MalwareBuster – Defender of Data and Protector of Your PC! What is malware and why should I want it busted? Anti-malware software targets malware – malicious software that lurks online as a program or file and presents a serious threat to your PC. Malware includes viruses, ransomware, worms, rootkits, and spyware – all designed to steal or delete your sensitive data, hijack your PC, and monitor your personal and private activity. MalwareBuster puts a stop to all of that. Anti-virus software only deals with the older, lesser of a threat viruses, focusing on less thorough, broad-spectrum protection from such threats as PC lockout and online activity tracking. MalwareBuster offers a much more complete PC defense solution, protecting you from the latest, much more serious, and ever-evolving online threats – it’s the solution to the most destructive online dangers you’ll face. 40% of all computers will become infected with some form of malware. 57% of computers are infected by viruses. 43% of malware infections that are not stopped by standard anti-virus software. 23% of computers use specialized anti-malware software. ARE YOU READY TO REALLY CLEAN YOUR PC? 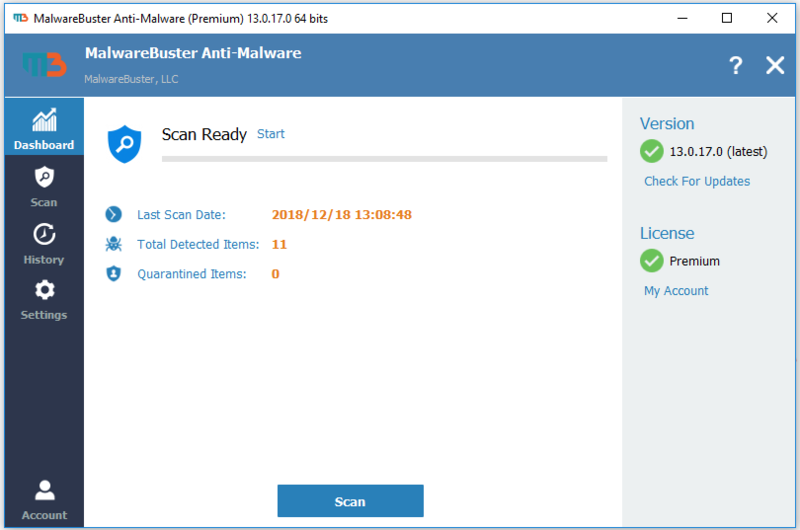 Reliable and easy-to-use, MalwareBuster gets right to the root of the problem, eliminating threats that you probably don’t even realize are lurking on your PC. Even the newest and most insidious threats don’t stand a chance against MalwareBuster’s aggressive and deep scanner (with Anti-Rootkit module), and Automatic Cloud Definitions that target the very worst of these online dangers. MalwareBuster puts a complete arsenal of easy-to-use tools at your fingertips, helping you eliminate malware and the dangers they pose. MalwareBuster uses state-of-the-art technology to thoroughly scan every file on your system, targeting, locating, removing, and documenting all malicious software it finds. MalwareBuster stops the dangerous threat of ransomware before it encrypts your system and locks you out of your own files. MalwareBuster catches and destroys the insidious software that hackers use to spy on your online activity. Your system will be secure, your documents safe, and hackers left helpless. MalwareBuster never stops protecting you. Automatic Cloud Definitions utilize innovative technology and comprehensive malware libraries to keep you safe every moment of every day.